Historically, untouchability refers to the group of people who fall outside of India’s traditional hereditary four-caste system of Brahmin, Kshatriya, Vaishya, and Shudra classes. They have traditionally been ostracized by society and viewed as impure or polluting because of their occupation in handling human waste. In 1932, Gandhi was a political prisoner in the Yeravada prison. During that time, he carried out an epic seven-day fast to protest the British government’s plan to establish separate voting electorates for touchable and untouchable castes. Gandhi won the battle against this policy on September 26, and in a statement to the press, he made it clear that although his fast was only against separate electorates, he would resume it if the elimination of untouchability was not relentlessly pursued and achieved within a reasonable period of time. “Untouchability is repugnant to reason and to the instinct of mercy, pity, and love,” Gandhi said. “No man can consider another man inferior to himself. He must consider every man as his blood brother. It is the cardinal principle of every religion” (from Speeches and Writing of Mahatma Gandhi, p930). 1) Educating and raising awareness about untouchability among caste-Hindus, and bringing to light all its forms through exhibitions, town meetings, educational literature, and beyond. 2) Constructive work to benefit the Harijans, such as building schools, providing housing, giving access to safe water, ensuring entrance into all temples, and collecting donations. In 1956, the Central Board took up the question of those Harijans, known as scavengers or bhangis, who were engaged for generations in the task of removing night soil (feces) from the old-style basket-type (dry) latrines, and who were therefore looked down upon even by other Harijans. Gandhi was very concerned with the suffering of these people because he felt that though they were considered to be at the bottom of society— they performed the most important tasks of maintaining community sanitation and health. “He is the social leper shunned by all, yet he belongs to the one group more indispensable than any other for the sanitary well-being of society, and therefore, its very physical existence” (Young India: Nov. 5, 1925). In 1969, the state enacted the laws of Bhangi Mukti (“scavenger liberation”) and Bhangi Kashta Mukti (“liberation of the pain of scavengers”). Bhangi Kashta Mukti addressed the problems of cleaning dry latrines and advocated the use of gloves, brooms, wheelbarrows, and hand-washing to prevent the spread of disease among scavengers. Bhangi Mukti addressed the problem of dry latrines themselves, and advocated their conversion to wet/flush latrines, thereby not requiring the removal of night soil from the latrine. With this solution, each household would be able to clean their latrine by themselves, and the need for scavengers would be eliminated. The government of Gujarat appointed Ishwar Patel as the Advisor of the Bhangi Mukti and Bhangi Kashta Mutki Programs, thereby establishing Safai Vidyalaya as a main agency for their implementation. In addition, the Social Welfare Department of Gujarat thought it appropriate to train scavengers, engineers, sanitary inspectors, chief officers, and safai karmacharies working in Municipalities, Corporations and Nagar Panchayats. Safai Vidyalaya was entrusted with the responsibility of training these groups. As the success of the conversion of dry latrines as well as the training programs of Safai Vidyalaya progressed, demand increased for training from various agencies such as the central government of India, the World Bank, UNICEF, WHO, and beyond. In response, Safai Vidyalaya constructed the Environmental Sanitation Institute (ESI) in 1985 to take on more complex and nationwide projects. At its outset, ESI promoted constructive programs in health, sanitation and the environment in both rural and urban areas. ESI has developed many successful projects, educational programs, and cost effective sanitation units that serve as a model for Indian as well as international institutes. Today, in addition to housing and running a continuous stream of sanitation programs and events, ESI is a space for inner-to-outer sanitation. 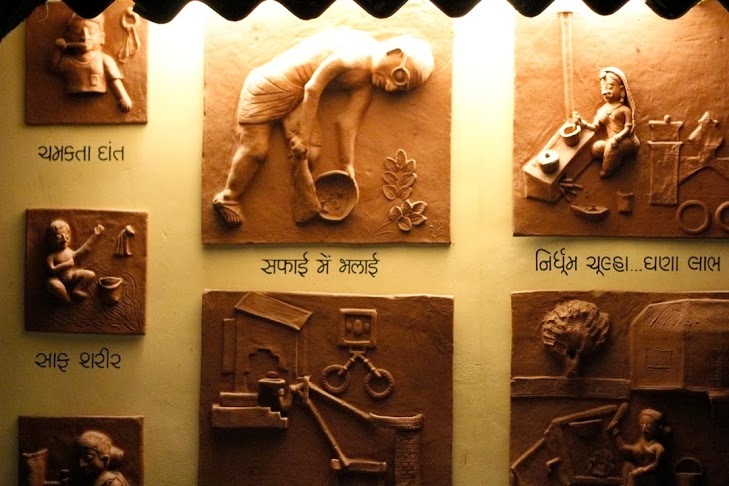 Through daily reflection, safai and seva work, regular ‘Maitri Space’ gatherings, and beyond, the external cleanliness work of ESI is inextricably connected to internal shifts and transformations within oneself.